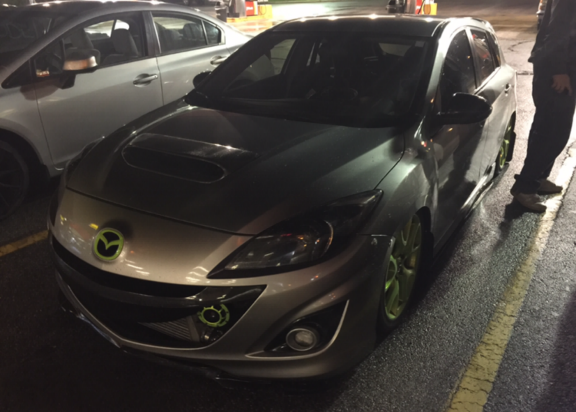 RaiderFab Gen Pu Installation Guide | Mazdaspeeds.org, The New Era in Mazdaspeed, CX-7 & Ecoboost Forums! Discussion in 'RaiderFab Bumper Fitment Solutions' started by CMajor, May 17, 2017. Last week @Sho and I helped install the @Raider Fab kit for a Gen 2 speed on @Shockerms3's car. I'd suggest reading through the entire guide before beginning just so you have an idea of everything that needs to be done. 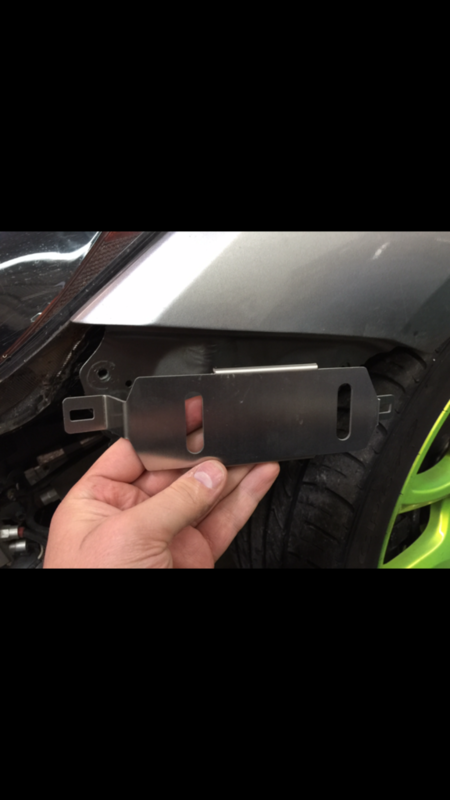 Remove bumper tabs using the flat head screw driver. 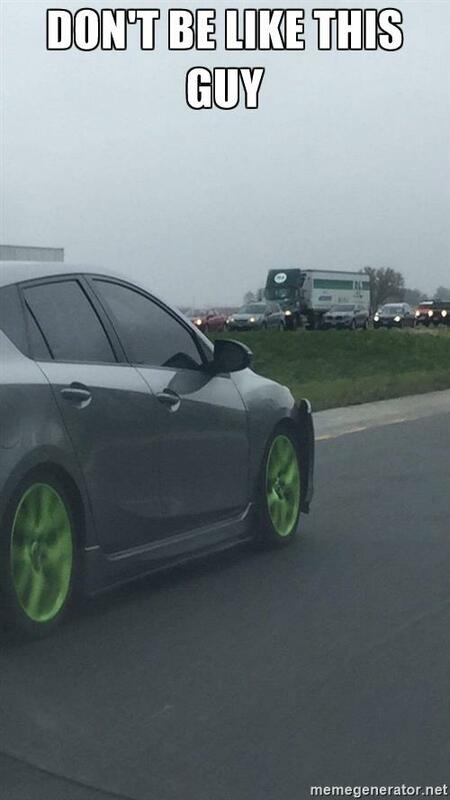 I didn't take pictures of that but if you're ordering this kit, you should probably know how to take the bumper off. 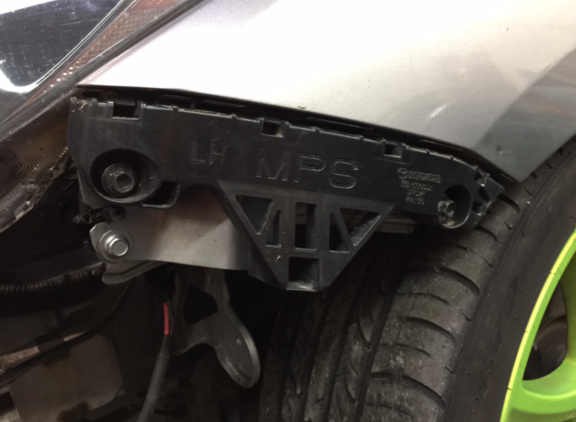 This is the OEM plastic bracket that holds the bumper on and we will be removing that. Remove the two black bolts first and there's a little clip on the back side that you can use the flat head to wiggle out. Below is a picture of the clip. 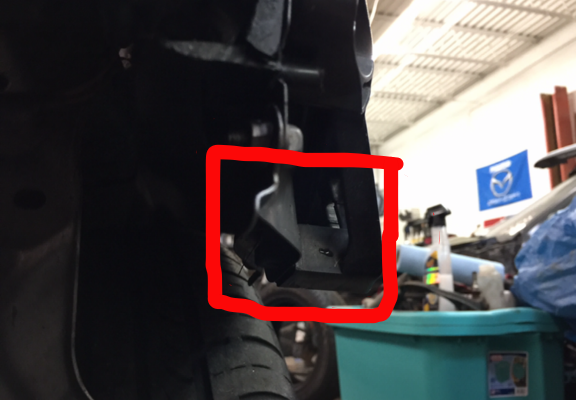 The first picture is behind the plastic bracket and the second shows the orientation of the bracket. It's pretty straight forward but figured it wouldn't hurt to add it anyways. 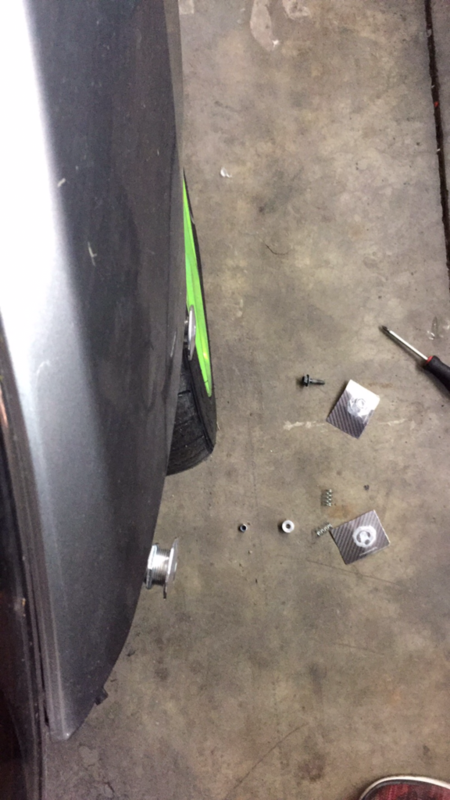 I laid out driver's side bracket on the ground to show where the OEM bolt and the supplied studs go. 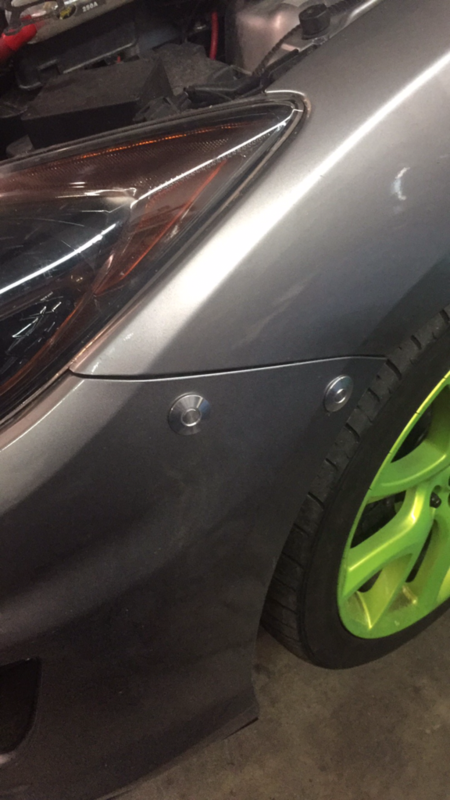 Essentially the left bolt goes in the same spot but the right bolt is replaced by the longer threaded stud. 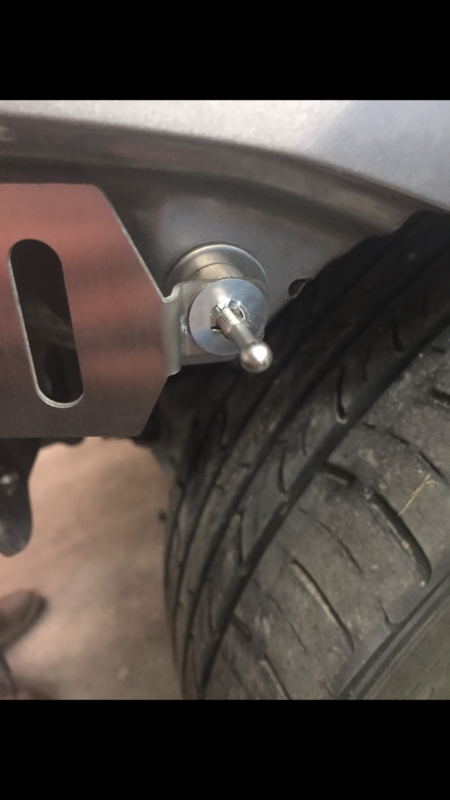 The shorter threaded stud goes on the left slot of the new bracket. Same for the passenger side, everything is just mirrored. On the driver's side working our way left to right we have the stock bolt and a spacer. 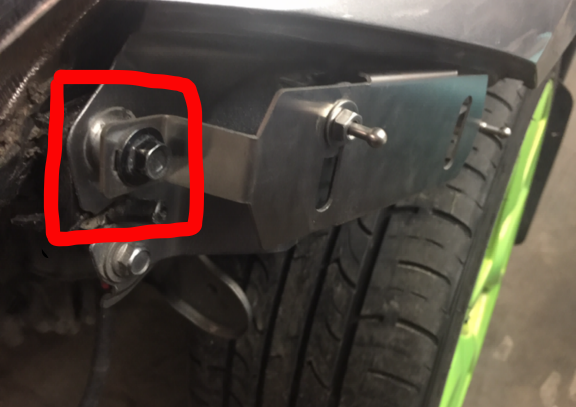 The spacer goes between the car and the supplied bracket, then just thread the OEM bolt through. Next is the left slot on the bracket, before putting the stud through the slot screw one nut on and slide one of the smaller washers on. Then slide the stud through and I used the larger washer on the back side along with another nut to secure it. We slid the stud all the way to the top of the slot then tightened it down. I used a wrench to hold the back side while I tightened the front with the ratchet. Below is a reference for how many threads were showing on the back so you know how far to screw the stud in before tightening. The next stud threads right in to the OEM bolt hole on the right side. On the front side we used the large washer, spacer, bracket hole then the lock washer provided. We removed the lock washer several times during the install which made the hole on the washer larger. We used the screwdriver to push the "teeth" down more so it locked like it was supposed to. Lastly we used one of the supplies nylon nuts on the back side to secure it in place. Ensure the studs are sticking out appropriately with the latches attached. You can see the fenderwell stud is pretty much spot on while the headlight stud is sticking out too far. We had to go back and adjust to shorten the length. If you follow Step 6 then you should be fine but it doesn't hurt to double check. This is where our friend Scott took over because we didn't have the guts to drill into someone else's bumper. I was actually gone getting food during this part but these are the pictures they took. This is the passenger side so you don't get confused since all the other pictures are on the driver's side. 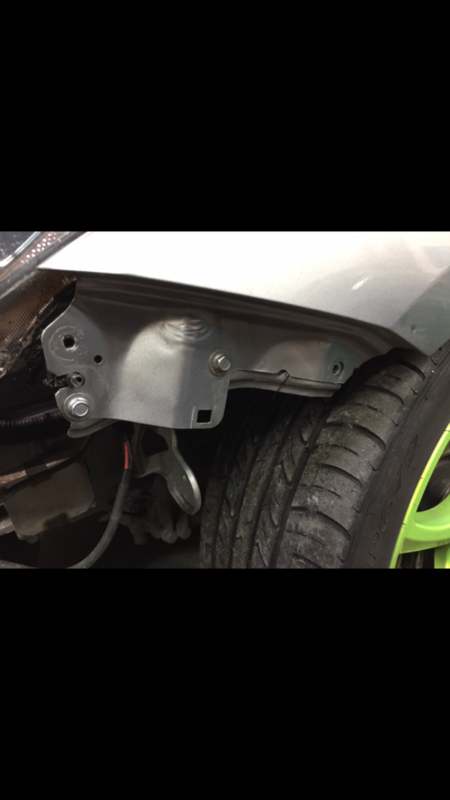 Scott started by using a paint pen and dabbing the ends of the studs then test fitting the bumper so he would know where to drill. 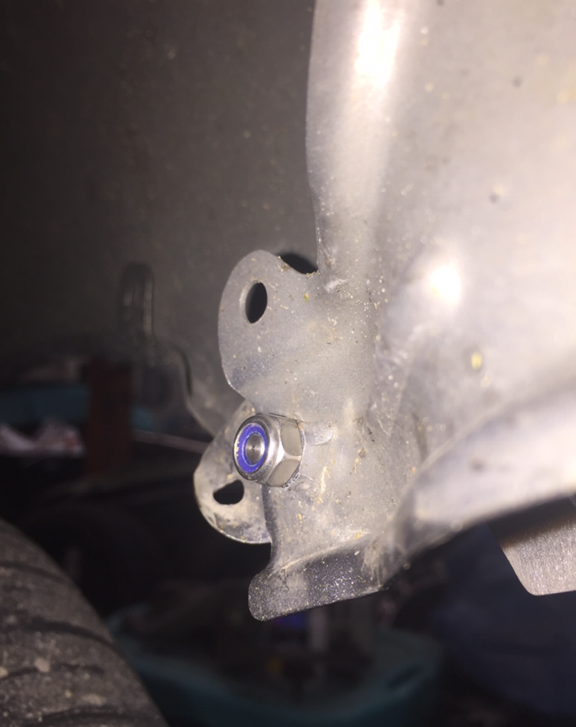 In the picture the right stud slid down from not being all the way tight so just make sure to tighten the stud against the bracket so it doesn't slide during the test fit. Next comes the fun part, drilling. He used a unibit drill bit to drill 3/4" out on each hole. Take your time!! Drill in slow increments and check often. It's a lot easier to drill out more if needed but if you drill too much then your SOL. These are the spots that Scott drilled out for reference. You can test the hole size by putting in the latches. This also gives you a reference point on where the holes should be. 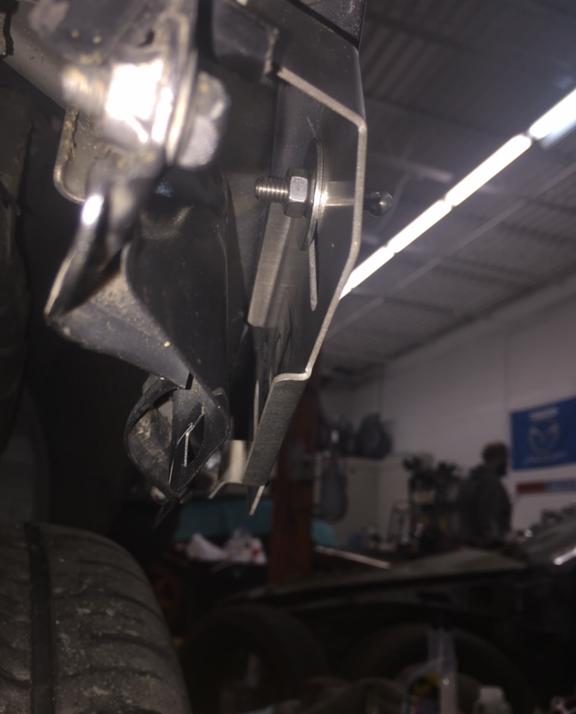 Raider edit: another option: Following my how to steps of a ball of claybar on the ball of the latch pin, punching the bumper and then step drill bit making sure it's centered works. Just like Gen1 fix. If you need to move the hole, it's easy. One step at a time. Pretty much like the OP. Secure the latches to the bumper and place the bumper back on. Make sure everything lines up and you have just finished the install! Let me know if you have any questions regarding the install and I'll update the guide if necessary. Pictures are back up, sorry some of them aren't cropped any more. If I get a chance later today I'll re-crop them. Hopefully Imgur doesn't sell it's soul too. Where did you want installed pics of this posted? I did mine a couple weeks ago. I think you could get rid of the rear slot (the one you taped over), useless for 90%+ of us. and maybe save on production costs in the future. i used the aluminum spacers in the back, nothing in the front. works like a champ. Personally, I like the look of that slot's location more that right by the fender arch. 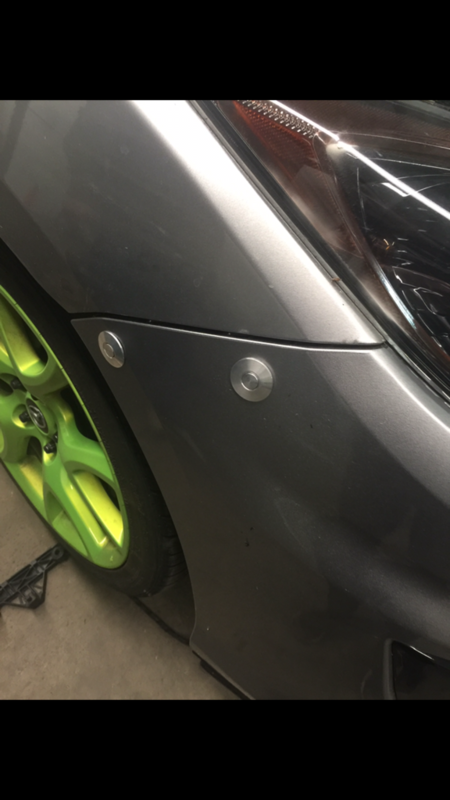 Of course, I had to use that slot because my holes were pre-drilled in my bumper, but if I had to do it again, I'd use both slots again--IMHO, it looks cleaner. Regardless, it's always nice to have installation options. I think spacers are only needed in the back. Will resolve that and the slot. 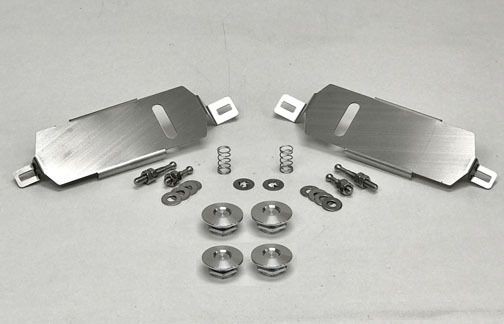 Mounting in the fenderwell area allows a wider area of latches holding it flush. Not sure if it will save $, but may cover the spacer costs we faced. Easier install too. 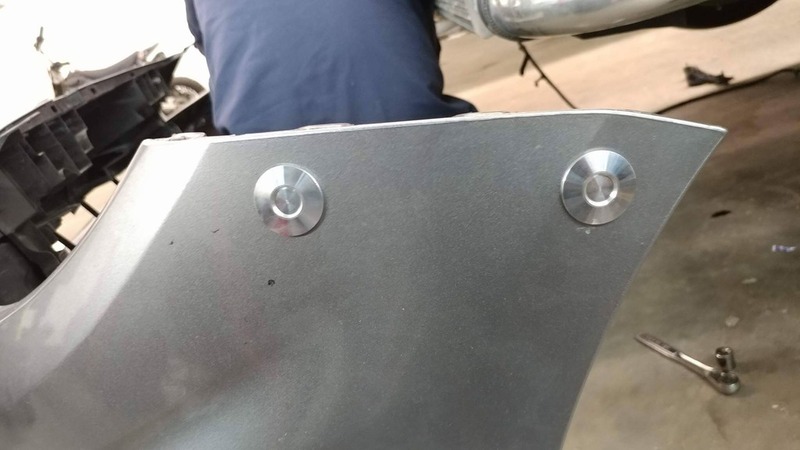 Front pin stud thingy just goes all the way up and forward. my next question is what if we only have one latch per side and it is for the head lamp. Would we use the bolt that is removed instead of the stud? 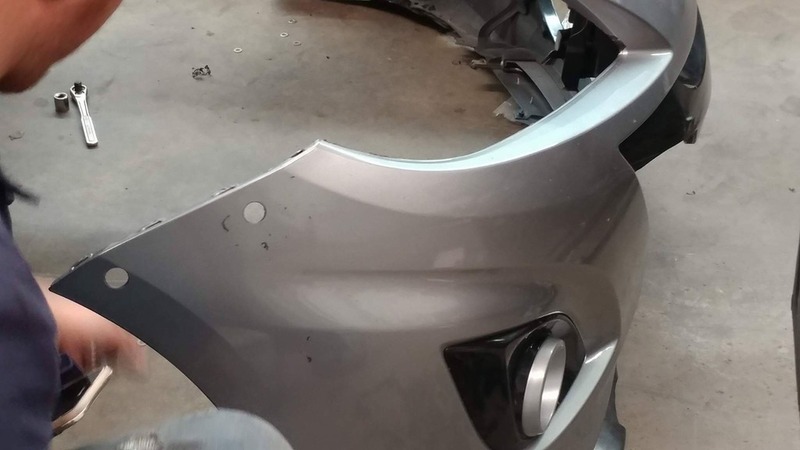 You have to remove the old black plastic bracket that the bumper cover used to snap into, so you will need both latches or the fender will now be floppy. So stupid question, but where do the springs go? Another stupid question, what's the purpose of it? Like this? the weird washer is upside down and needs to be up past the threads on the stud. It's purpose is to help pop the latch off when you push the center button. Totally optional. here is another pic that may help with spring orientation. So am I being retarded here or what? I can't get it any more flush. Maybe my car is retarded and I don't need a spacer? View attachment 7152 So am I being retarded here or what? I can't get it any more flush. Yes I was using a spacer, I edited the post and posted a picture without a spacer. Guess my car is stupid and doesn't need them. I just needed spacers on the rear. RaiderFab and Quik-Latch.com are teaming together again! 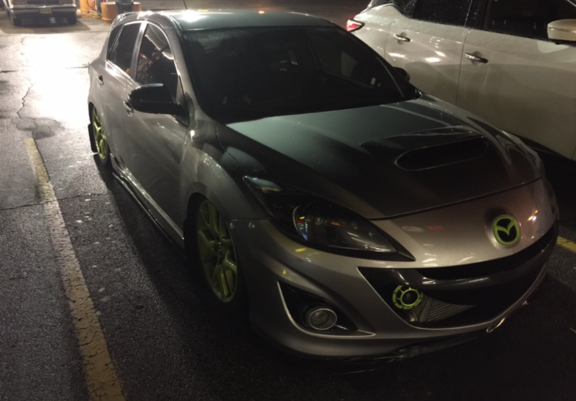 GenPu Bumper Fitment Fix! 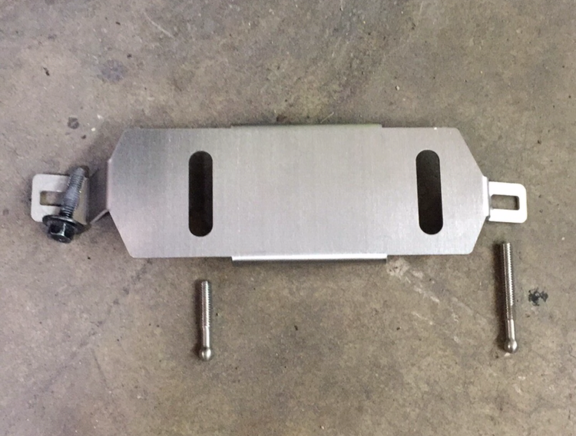 Ordering RaiderFab Bumper Fitment Solutions are going to become easier! RaiderFab Needs a Logo for decals!